not if it screws up the steering geometry.. a shorter fork in a suspension compensated frame design steepens the head angle as it drops. what you need is a long blade suspension corrected fork so the frame stays at the height it was designed. .. The fork doesn't know what frame it goes into. As long as you've got mechanical fit, geometrical fit and no excessive loads you're OK.
On a 29er? Not really, you give up tire clearance and gain nothing really. Plus it might screw up the geometry. On a 26" MTB? That would be really dumb, unless you're after some sort of 700c conversion. But then you'd still need to work out the rear brake situation. It probably isn't a good idea, but if you give details as far as the exact bike and fork you want to use you will help enable an intelligent discussion. Given the brevity of the question, a resounding "no" in your case. Plus this has been bantered about ad nauseam here bouts. Having said that my shop has done such conversions numerous times in specific applications with excellent results, given that considerable thought precedes the project. on a 26 inch bike. Basically, it's easier finding rigid road bike forks than rigid mtn bike forks. Just wondering how the geometry would slide up or if it might be uneven. All depends on where you Look .. googled " suspension corrected mountain bike forks "
will also keep the head-tube up as high as it was when the suspension fork is in place. common sense and mathematics : an arc with the center axis the rear wheel axle. and the distance the drop is, can be known ..
depends on the chosen fork's tip axis to crown race seat and the rake/offset of the dropout tip/axle center ..to the steerer center..
what it may feel like is an Opinion. Last edited by fietsbob; 04-18-14 at 01:57 PM. Is this a good idea? NO. For one thing you'd be running two different wheel sizes. Geometry will probably be terrible. Just find a 26" rigid fork. They're out there, and not very rare either. There are a bunch of rigid fork options on Niagara Cycle's web site, starting under $20. If you use cantilever or v-brakes, you'll need to use a fork designed for 26" wheels or else the bosses (mounting studs) for the brakes won't be in the right place. Might steepen the head angle a tad (maybe 0.67° or so), probably NBD, but not sure what would be happening to your trail, you'd need to look into that. I agree, a disc brake fork designed for a 700c wheel is probably your best bet. I did it on a mid-90s MTB, designed for 80mm-ish travel forks. ran 700c wheels front and rear. Old Dia-Compe road caliper on the rear brake bridge worked great. I used a 395 atc 26" fork with a long reach 1999 RSX caliper for a while, then went with the road fork and a short reach Gran Compe. Couple of overviews, all with 700c wheels. It's a Park Pre 825 Pro, IIRC. Made for a pretty good road bike, but too stiff for my taste. The comfort level was acceptable with 28mm+ tires. That depends on the frame. Got pics, or Make/Model/Year of the frame you have in mind. I'm with 101. The walls of the backrooms at the co-ops are lined with rigid 26" forks. Depends on frame and fork. It's not likely gonna "slide up". The front end is likely to remain about the same or drop some, it might slide up a bit if larger tires are run. 700c x 23 is about the same as 26" x 2.125"
I've never seen this done before. any photos? Really curious how the spacer seats to the crown and race, any issues with play between top end of spacer against steer tube? I've not heard of that done either. Origin8 did/does have spacers that go between head tube and bottom cup, however. But fietsbob- the OP didn't say he was replacing a suspension fork. Apparently the ability to do bar spins is hugely important to a part of the fixie crowd. The item came with plenty of disclaimers - do on your own risk - kind of thing. I did this with my jamis dragon. In my case the frame was meant for 80-100mm of travel and going with the bigger wheel worked similar to a suspension fork. Like others have said it's all a matter of geometry. Here is a picture of my dragon with a surly cross fork. 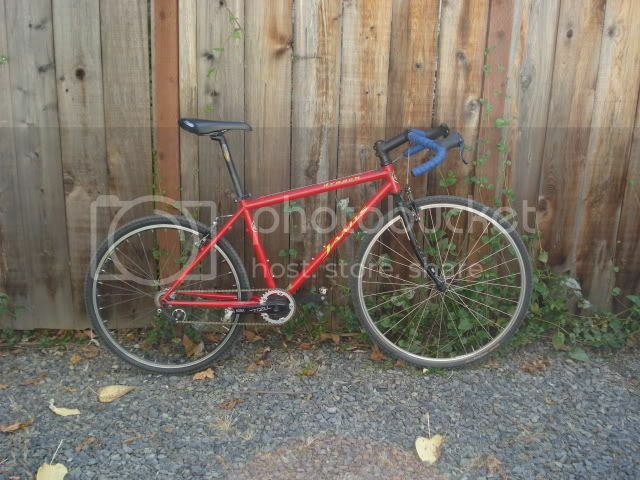 I ran it as a pit bike for cyclocross and generally played around on it and it handled fine.